GL581 (Red Dwarf) - Exoplanets too distant to be seen. Yes, extra-solar GL581g has been discovered as a definite Earth-like exoplanet. It could very well have an atmosphere and water; important life support ingredients. Unofficial comments about a future mission to GL581g are already filling social networks. The key questionis will that expedition ever happen? A large chorus quickly shout YES, but a more sullen, conservative audience expresses resistant doubts. Well, lets join the “can do” crowd and see just what it would take to visit the Red Dwarf and its string of planets; especially GL581g. First there is the matter of distance. GL581 and its solar system is 20 light years away. That converts to 117,572,507,463,672.14 Miles. This is not just an around the corner distance. Current spacecraft and propulsion systems would not carry humans that distance unless we used sci-fi science and put the explorers in deep freeze for years and years. Oh, well then lets just forget it. NO! Read on to see what can be done. What about time-lapse? Considering the distance cited above we need to be able to make the journey at near the speed of light . Assuming we could achieve a propulsion system that could provide a thrust equal to 2/3 the speed of light (199841.653 km/s) which converts to 447,032,987 miles per hour, we could achieve this speed. It would take us 30.2 years to reach GL581. Oh, well, see lets just forget it! NO! There is still more to consider. Please read on. Warp Drive or what propulsion system? You can forget sci-fi science warp drive stuff at the moment and instead think about a propulsion system that could supply constant acceleration such as an expansion of the VASIMR propulsion system concept. To help you understand this take some time to understand acceleration, velocity and speed. Any good physics text on motion should give you all you would need. O.K, so we could get there in less than 30 + years? Not in the beginning. It is best to plan around that time factor. Nuclear Power (Fusion) is a must. To reach the desired state of constant acceleration and to sustain it we need an energy source that can support the expedition for longer than twice the one-way flight time (We do plan to come back to report our discoveries). Right now the type of energy source that could be installed and operated in a spacecraft does not exist. There are many critical breakthroughs that must be achieved for this to become a reality. Roskosmos of Russia is working on nuclear power propulsion and NASA did once, and must start again – NOW! Humph, most folks are scared silly of nuclear power so is that even something we should think about? YES! We just need to grow up to where we can manage nuclear energy responsibly and safely. The U.S Navy does it all the time, so….? The spacecraft design. Unlike the concept of Earthship I, a spaceship under constant acceleration will create its own artificial gravity that will offset the effects of long-term exposure to weightlessness and the associated physiological effects on astronauts. Obviously in addition to the aforementioned propulsion system, the spacecraft must be designed to accommodate a crew over an extended journey. Protection from cosmic effects (radiation, meteor strikes, supernovae events, and black holes are serious hazards). Entirely new design criteria must evolve and should be aided by the spacecraft designs we have made and will develop for exploration of our own solar system. Well seems to me we should consider the first voyage based on a totally robotic crew. This could enable us to do out first exploration more safely and at less cost. YES, that is correct and is in the plan. Good, now who is going to foot the bill for all of this? The U.S. Congress? NO, not entirely. The only way this is going to come about is through an international effort that is represented by a formal international space organization that shares in all aspects of the expedition. To see what we mean review again the details in Part III of the Earthship I blog article. Mission 1 of the Gliese Expedition will be a robotic mission that will allow us to assess many factors involved with a very long-term, deep space exploration. This will be a less expensive first start and will also give us time to fully organize the development of the International Space Organization. Unless we can assure this new spacefaring unity and comradeship, our success in deep space exploration will be extremely limited. O.K., so what is next? Well we have a lot more to present and to discuss with you so we are going to do at least one follow on blog article that will present our ideas about that first, robotic , voyage to GL581. We urge you to plan a return visit (in a view days) for our presentation of The Voyage of GLIESE 1. 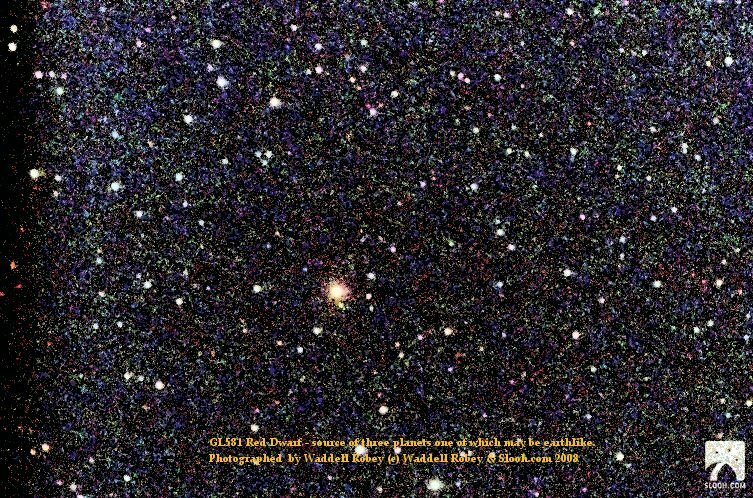 Astrophotograph of GL581 – Red Dwarf. Courtesy of Waddell Robey and Slooh.com. (See copyright notice on the image, please). This entry was posted on September 30, 2010 at 11:25 and is filed under Deep Space Explorations, Humankind and Exploration, Robotic Exploration, Scientific Research, Sustainable Energy. You can subscribe via RSS 2.0 feed to this post's comments. Aneutronic fusion energy could be a good option to take us there. Thank you for your suggestion, that is very interesting. It would certainly be a considered system, I would think. A reader from Canada has suggested that the total time to travel to GL 581 area would be approximately 35 years at 2/3 the speed of light rather than the 30.2 years I showed in my calculations. No argument over a five year difference, but I doubled checked my calculations and they came out the same. Maybe there is a difference in the ly distance to GL 581. Any updates are appreciated. Well the Gliese exoplanets are many light years away and it will take generations of Earthlings to arrive there. Actually Earth, IMO, will not get destroyed, unless we do it to ourselves. There are a lots of spoofings going around about aliens (those are ET’s bad neighbors), but that is spoof not truth. We need to learn to preserve and protect Earth first if we are to eventually learn to live on a distant planet. So don’t worry about living out there, right now worry about keepilng Earth alive and well so that we can remain alive and well. Thank you for commenting and have a good weekend, on Earth.